Activate your free Tracphone Voice mail by using a land line. You may have to go in and change your PIN from your tracfone. You can reset your message and set your preferences from a land line once you have reset your PIN. Check your Tracfone wireless voicemail from a landline. Put in your voicemail message that you don't check your voicemail and that you will call back when you get the number on your phone. Voicemail takes a lot of minutes to check with your cell phone and beeps at you until you check it. With my latest Tracfone I did not set up my voicemail. That way I don't get messages left. The caller ID gives me the number of my last 10 phonecalls. Use the caller ID function on your Tracfone like a pager. Do not answer calls from friends and relatives if you are near a land line. Just call them right back. Hang up within 15 seconds if who you are calling doesn't answer right away. Then you aren't charged for a minute. If they have caller ID they will usually call you right back. This doesn't work with all of the Tracfones. Some of the GSM phones charge you for a minute as soon as you push the send button. Always check online for bonus minute codes when you are adding airtime. Check my Tracphone Minute Codes Page for Bonus Codes. Often you can get an extra 40 to 200 minutes depending on what card you are adding. Do not buy Tracfone minutes. Normally if you go to the website and buy a Track Phone you can get more minutes for less money than buying minutes. Usually the best deal on phones is from TracFone.com. Normally the best way to buy a Tracfone is to buy the Tracfone Minute card that comes with a free phone. Only use Tracfones that come with DMFL or already have DMFL installed. Be sure to activate the phone before you sell it. That way Tracfone will not cut you off from buying phones from their website. You can only buy 3 Tracfones from the website at a time. You can go right back and order 3 more. If you wait until your first order has been processed you will not be able to order more phones until you have activated the phones you bought. How to Deal with Tracfone Problems. Tracfone Problems how to get better service from Tracfone Customer Service. Don't Complain How to get your problem solved!! New-Tracfone-Bonus-Code. Get 200 Free Tracfone Bonus Promotional minutes with This FREE bonus Code. Hurry The Tracphone Code expires. What are Bonus Codes-for-Tracfone and How to get Free Tracphone minutes using Promotional Codes. Best Free Track Phone Promotional Codes. How to Setup Tracfone Voice Mail. How to set up Tracfone Voice Mail. Compare Prepaid Cell Phones.com will shows how to use Track Phone Voicemail. Tracphone Tricks to Save You Money on your Cell Phone Usage. Activate your Tracfone and Save Cellular Minutes and Money. How well does the Tracfone Nokia 1100 GSM Cell Phone Work? The Tracfone Nokia 1100 is one of the most Popular Prepaid Cell Phones. What are Tracfone Texting Rates? What are Tracfone Texting Rates for their different phones. Tracfone Texting Rate is Different with GSM Phones VS CDMA Phones. Is the Tracfone Single Rate a Good Deal? Will the Tracfone Single Rate Phone work anywhere? Which Tracfones are Single Rate and What is the difference. Can you Unlock a Tracfone? Can you Unlock a Tracfone? If you unlock it will it work on Verizon or T-Mobile or Net10? Tracfone-Minutes For less than 10 Cents per Minute, Compare-Prepaid-Cell-Phones.com shows the Cheapest ways to buy Tracphone minutes. Best Track Phone Minute Deals. What Happens with a Lost-or-Stolen-Tracfone Cell Phone? With a Lost-or-Stolen-Tracfone can You get your minutes and activity time transferred on to a new Track Phone Cell Phone? Will Tracphone transfer your Stolen Track Phone minutes? We Compare the Tracfone LG 3280 at Compare-Prepaid-Cell-Phones.com to the other Track Phone Flip Phones. This is the finest CDMA folding Tracfone. The Tracfone Nokia 2126 is a Great Phone. The Tracfone Nokia 2126 is a great little phone. Is it the best Pay as you go CDMA Trafone? Will the 2126 work in your area? Tracfone Camera Phone now available. Take pictures with the Motorola C261 Camera Phone. What does it cost? How does it work? Motorola-V170 The finest new Tracfone Flip Phone with Color Display and No Roaming. The Motorola-v60i Tracfone Flip Phone. Rating the Motorola-v60i Tracfone Flip Phone, Is this the Best Prepaid Tracfone Cell Phone? The best Tracphone Prepaid Plan for your Motorola V60i. How to Change Tracfone Area Code. How to Change Tracfone Area Code on your Phone. When do you need to change your Track Phone Area Code and why. Compare Prepaid Cell Phones.com explains. Free-Minutes-for-Tracfone Cell Phone tricks from a Tracphone Master. The best way to get a FreeTracphone phone and hundreds of Free Track Phone Minutes. We Compare-prepaid-cell-phones. Which Tracfone GSM or CDMA phone works better? Which Tracfone GSM or CDMA phone works better? What is the difference? Don't Activate Tracfone Before You Read this Page. How to Activate Tracfone and Get the most minutes for the least money. Tracfone Net10 Sim Card How do they work? Can I move my Tracfone-Net10 Sim Card from Phone to Phone? The Best Tracfone-Flip-Phones and How to Get a Flip Phone from Tracfone. Tracfone-Flip-Phones are the Best. 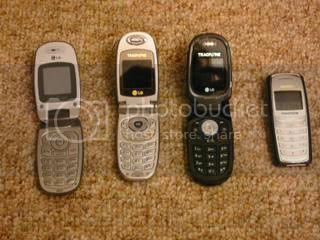 Get A Motorola V170 or a Motorola V60i Tracphone Flip Phone. How to Redeem Tracfone Airtime Minutes. How to Redeem Tracfone Airtime units on your Cell Phone. Compare-Prepaid-Cell-Phones.com explains the 3 different ways to Redeem Tracfone Airtime. Tracfone Insider is the Newest Tracfone program. Sign up now and get 20 minutes for free and Extra Bonus Codes in the future. Check out the New Tracfone Motorola W370 Prepaid Cell Phone.